I wanted to make sure everyone sees today's blog post, honoring Pride and, especially, Orlando. I'd love to hear folks' ideas on other things we can do to support victims and their families, as well as the LGBT+ community as a whole. I will message you privately. Sorry we couldn't get it out faster. I wanted the logo change to go at the same time, but Conceptdawg has been out sick. Jumping out at me are Aaron Copland, Gertrude Stein & Alice B. Toklas, Susan Sontag, Andy Warhol, Oscar Wilde, W.H. Auden. "Probables" include Willa Cather and Henry James. Thank you, I just started a thread for E.M. Forster since he is a favorite author of mine. I will see what I can contribute to those mentioned. >5 knotbox: An excellent suggestion. Last year for Pride, we highlighted Gertrude Stein & Alice B. Toklas's library, so I think that one's done. Feel free to suggest others that come to mind! >7 lilithcat: & >10 Crypto-Willobie: Are these suggestions or in progress? >11 knotbox: The ones I listed are either In Progress or Complete. Most of the ones I listed are complete. Cather is "in progress" and Henry James is "proposed". While I am technically an employee of LibraryThing, being on the LTFL side means that 99% of my engagement on LT is as a member. 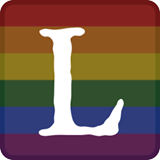 As a member, I want to thank the LT staff for their heartfelt support on an individual level, for the company support of my personal needs, and for the knowledge that I am valued as a member of the LGBTQ++ community who is also an LT employee and member. I'm on my local Pride steering committee: this is my third year volunteering for the (3 year old) organization. This week has been really f**king hard for all of us. The support of my company and colleagues is a large part of what has kept me going when my heart and brain have been wrung dry. I am so grateful. Since I haven't really said it elsewhere: my sincere condolences to all the victims and their loved ones. This has hit so many people so hard. >12 Crypto-Willobie: So that's where all that stuff hides! I expect I'll be poking my head in shortly to help. Nice touch, I like the changed logo. I haven't seen it displayed anyway here, so I hope it's ok to put it here. Yeah. Twitter and Facebook. Ends Sunday night. >19 bnielsen: Absolutely! I quite like it. When that didn't turn up anything I went to the blog post and I guess that was probably what you wanted. Right. Sometimes that too becomes an "L" but it's browser-screen-size dependent. The complexity of that situation—with matting going on too—made it unattractive for us to fiddle with it. This is why LT is my forever-home. I know that I'm butting heads with you elsewhere now, so let me say that I do think you personally are on the right side, and I try not to lose sight of that when I think site policy is on the completely wrong side. >23 timspalding:. Ah, the immovable object of LibraryThing. Sure. Do you have any info on this library--if it still exists, or was auctioned off, etc.? >27 thesmellofbooks:, >28 timspalding: Doesn't a Legacy Library imply that the author has passed on? Delany is still around, recently retired from his teaching position at Temple University. Remarkable guy. It does seem like it would be cool to start building a Legacy Library now, while he's still around, though (and no, I'm not volunteering). Ha. Yeah. I figured he was dead. Thanks for this, guys. Much appreciated. Worth mentioning: http://www.weareorlando.org/, with lists of vigils, resources, etc. as well as a link to the fundraiser on GoFundMe. There's also https://www.oneorlando.org/, a fund started by the city. a belated thanks for this, folks. as a 72-year-old lesbian woman, i'm grateful for just the logo change and the recognition of the tragedy itself. i think the greatest thing for me is already available: i have found places here that are "home," places where what matters are books, civility, humor, shared respect and inclusion. and of course, books. places where neither my age nor my sexual orientation are obstacles. we all love books and the people who love books and that is what is important. Sorry, I f this is the wrong forum to ask my question, but I could not find a more suitable place. I bought several years ago a life time subscription, but to be honest I was using LibraryThing very sporadically. Starting several weeks ago I learned about calibre and catalogued enthusiastically all my books (not only my ebooks). After I while I wondered why there is no integration between calibre and LibraryThing as it is done (via a plugin) with Goodreads.com. As I asked people in the forum of mobileread.com they told me that there was – years ago – a plugin for LibraryThing, but then LT stopped to allow to grab metadata automatically. Is this true? An if so: what is the reason for this policy? This thread has absolutely nothing whatsoever to do with your concerns. You would be better off starting a new thread in this group.